AMC Trails Blog: The ephemerality of all things: Or, where DID the Great Gulf Shelters go? The ephemerality of all things: Or, where DID the Great Gulf Shelters go? (Hastings for example, which is now known as the Wild River Wilderness). Of particular interest to the campsite program are backcountry shelters, cabins, and camps. For our own project proposals, and also in constantly seeking to educate ourselves about the history of the campsites we steward, we often dig deeper into the stories behind sites. This is how we discovered that there were not one, not two, but at least four Imp shelters, and how we parsed out the history of the when and where the current alignment of Guyot campsite came from. Wait a minute. ShelterS? Yes, the Great Gulf was host to three (actually, four) different shelters, located in two different places, all removed and built at different times and different ways. 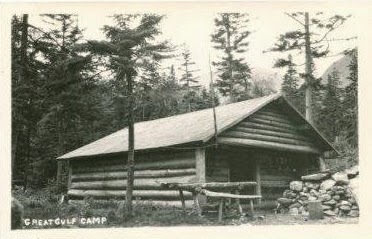 The first was built in 1909. (see photo above). It was of the classic early-White Mountain shelters, a mix of the trees found nearby that could be moved and shaped by hand. The next was built in 1927 (it is unclear to us whether it replaced the 1909 one), at more or less the same location. 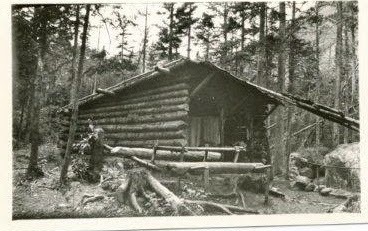 This one is a big one, resembling a logging camp cookhouse or bunkhouse, and was described as fitting 22. In 1927, this was the only recorded shelter in the Great Gulf. Fast forward to 1959, when the next shelter was built (if you’re keeping count, this means that there are now two shelters in the Great Gulf). This one was built across from the larger one, and was similar in design to the current Ethan Pond shelter. It had vertical logs and an open front, and could fit 10. By 1969 there were three Great Gulf Shelters: in the decade after the 1959 shelter, one arose at the Bluff, an area about 3.2 miles from Dolly Copp. In 1964, the Wilderness Act was passed. The Great Gulf Wilderness was created along with the Act. We can only assume (but have not confirmed) that the third shelter, near the Bluff, was constructed before 1964. By 1972, we were down to two shelters, the 1959 Ethan Pond-Style shelter and the one at the Bluff. These two shelters were around in 1976, but not by 1980. How do we analyse this information regarding the sudden appearance of three shelters? Some of it can be traced by the trends of backcountry construction, which in broad strokes can be defined by this: shelters built by trampers/ early pioneers, shelters built by trail crews/ CCC crews (1930-1980), shelters removed in favor of platforms in the early 1970s, and shelters repaired/ replaced from the 1970s until today. We acknowledge that in this particular example, these shelters were located in a federally designated Wilderness area, and thus are governed by an array of management techniques to foster that intangible sense of wild-ness. However, the story of the Great Gulf shelters are similar to the stories of so many other shelters that have come and gone across the Forest, from Cascade Camp to Nauman Springs. (extra points for anyone who can name where those two were located). But HOW do we figure things like this out? And who is the ‘we’? Fortunately for the AMC Trails department, in addition to having our superb AMC archivist Becky Fullerton in Boston, we also have a slew of White Mountain history buffs who are archives in their own right. One of them lives right down the hill from us, the great Ben English. Ben and I (Sally) were the ones who dove into the primary sources we had at hand, which were White Mountain Guides, Appalachia journals, and Ben’s personal collection of photos. Within a few days, Ben and I (with the aid of Mike Dickerman) had quickly found the above information, and relayed it back to Boston for our publications folks. I share this with you now as a brief linear tale of how shelters have come and gone, and the style and format they arose with. We build shelters now with beautifully crafted pre-fabricated logs, and we are also in the business of repairing our shelters that were built by Trail Crew in the 1970s and 1980s. Today our shelters still serve a purpose, structurally and experientially, even though many people prefer to use tents. AMC has a fleet of 18 campsites in the White and Mahoosuc Mountains, and of those 18 only 10 of them have shelters. 100 years ago, the landscape of the backcountry was very different. And thus, we honor and recognize the ephemerality of all things.